Advantages: Upgrades to a reasonably good older kit; includes figures and etched brass. 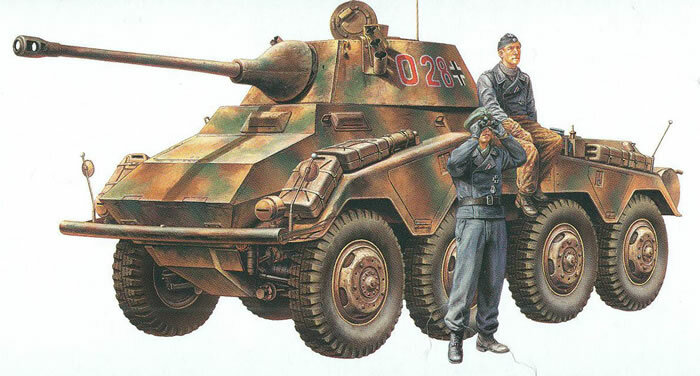 The “Stroke 2" was the only one to receive an actual name and fit in with the service models of many other vehicles in the late war period – the tracked Luchs reconnaissance tank, the Panther medium tank, and the Tiger I and II heavy tanks. Fast (80 kph/48 mph), well armed with the Pak 38 5 cm derived gun, and had a long range (900 km/560 miles). Armor provided proof against small arms of 7.62mm caliber and shell fragments. Since its Tatra 103 engine was a 12-cylinder air-cooled diesel, it had a major advantage over other nations’ armored cars. The Puma has long been a popular subject, and this kit originally appeared as their Kit No. 202 back in the late 1970s. But with the advent of newer and more detailed DML kits – with nearly twice the parts and etched brass included – it became passe. Now Tamiya and Italeri are “tag teaming” kits they have turned their attention to the Puma and made some changes to the original kit. Some of the parts have been remolded to make them more accurate and some of the sprues now reflect these changes. The entire mounting system for the 20 liter “Jerry” cans is now offered as styrene (the original kit) with etched brass strapping in a new fret from Italeri’s supplier Fotomeccanica. Tamiya has added two new mold crew figures; this time the commander appears to have no neck (he is wearing a scarf!) but is at least 5'8" tall so better than the “dwarves” in the older Tamiya kits! Italeri’s directions have been replaced by the usually excellent Tamiya ones and start with the suspension, which as with many older kits comes with a number of mold seams to be removed. It retains the two-piece styrene wheels but with the use of a Flex-I-File the seams are not a problem for removal with this type of design. Good thing as there are nine of them with the spare. None of the fender bins are accessible but there are liners included for them which is an improvement over the very early kits of these vehicles. Lower hull hatches are also sealed. There are the remnants of the interior from the other Sd.Kfz. 234 kits but no hull interior is provided. The turret has some new mold bits like the 5 cm muzzle brake and also a relatively complete basic interior with 5 cm and MG 42 breech assemblies, seats and some other details. The gun barrel and muzzle brake are two-part molds and will also need attention from a Flex-I-File. 2nd Aufklaerungsbattalion, 2nd Panzer Division, Normandy 1944 (tricolor - red 1111). A small set of targeted decals is provided but the SS runes are missing from the 1st SS unit. Overall this is still a nice kit and can be built as an attractive model. It is an easier build than the DML one and also comes with the superb Tamiya directions.